This is old version Seven Knights 1.1.00 apk for Android, you can install it if you want to downgrade or install old app. 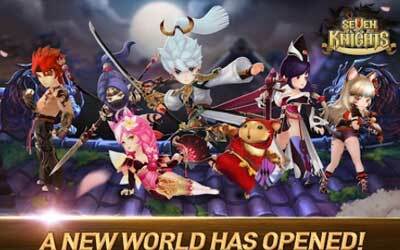 It is top Role Playing apps from Netmarble Games. There will be seven knight characters which have different backgrounds. Each of them will be the ruler of territories in Asgar. And as the time going, there will be some betrayal and ambition of each character that makes this successful Netmarble’s game even more interesting. Other reason comes in its graphic. It seems like the company has worked really hard for this. The graphic of this game looked so soft, detail, full of stunning effects, and each characters comes in dynamic look. Further, when playing Seven Knights, you will be face in 10 levels of world. Each of them consist 10 stages, and there will be some heroes that you can get by defeating the enemies in each stage. Moreover, combined with the relatively easy control, this game will definitely be the best choice to spend your free time. So, if you want to download an amazing RPG game with stunning graphic and dramatic storyline, then Seven Knights for Android would be the best choice.